For the past week, Koei Tecmo has been counting down to the announcement of a new game from Dynasty Warriors developer Omega Force. It’s an Attack on Titan game, according to the 17th Attack on Titan manga volume launching on Friday, and it’s coming to a PlayStation platform this winter. The fields all kinds of things going on, like cannons mounted on the castle gates, and various weapons and ammo in the storage areas, which you’ll also get to use in the fights. 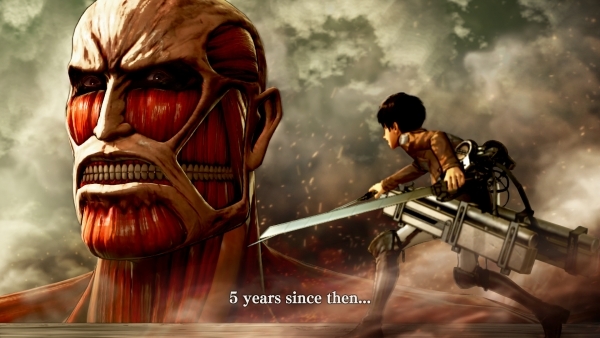 Attack on Titan will release in Japan as early as this winter, and in 2016 for the rest of the world for PlayStation 4, PlayStation 3, and PlayStation Vita. 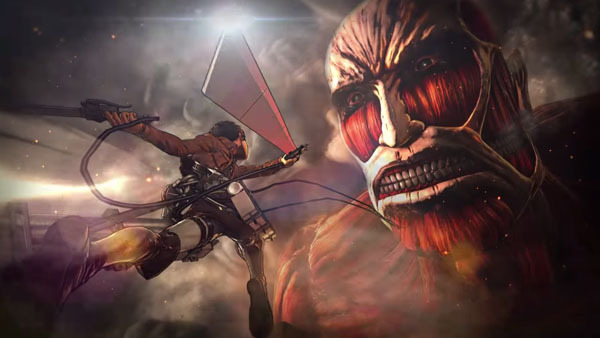 Koei Tecmo talked about how the 3D Maneuver Gear’s controls are something they’re focusing on for their upcoming Attack on Titan game, and we get a peek at how it looks in the game’s latest trailer. Attack on Titan will release in Japan this winter, and in 2016 for the West, on PlayStation 4, PlayStation 3, and PlayStation Vita. ...saka parang enjoy yung gameplay. some related screens. not much. 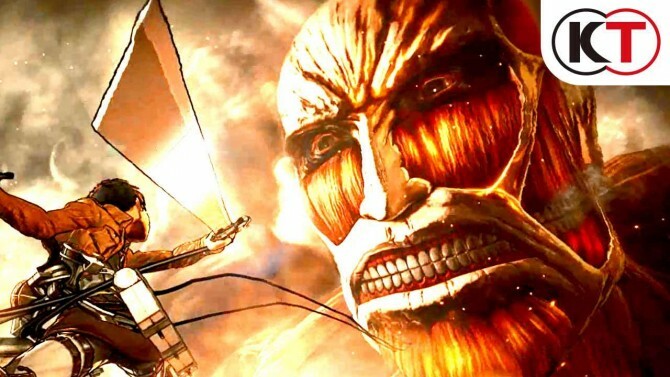 The upcoming third person, action game Attack on Titan, being developed by Koei Tecmo, looks like it’ll be a strong addition to the already popular manga and anime franchise. Today Koei Tecmo released new screenshots and also gave us some information on how the battle systems will work in the latest issue of Famitsu. There was some great gameplay footage shown a month ago that featured the 3D maneuver gear and how combat will look in-game. Our very own Kyle Wakeling broke that story and you can view the original video by clicking here. The newest details tell us that every time the 3D maneuver gear is used, the gas used to fuel it, will deplete over time. It will then be necessary to periodically refill your empty tanks if you want to continue slicing the napes of the Titans. However every time you engage in combat and use your blades, the sharpness of them will diminish over time. 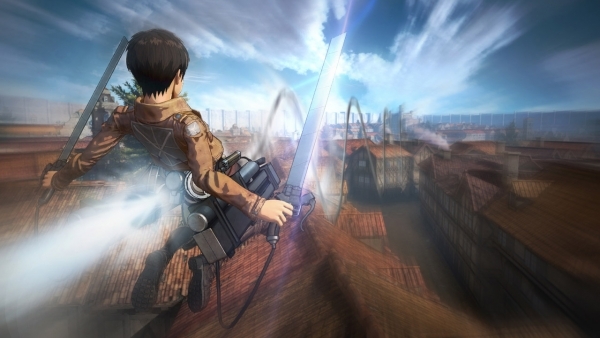 Luckily, Koei Tecmo also revealed that there will be original weapons that have not been seen in the Attack on Titan so you won’t be constantly worrying about maintaining your blades. An “Official Investigation Record Collection” soundtrack. A muffler towel also known as a scarf. Two sets of Eren, Mikasa, and Levi tin badges. A download code for exclusive costumes. 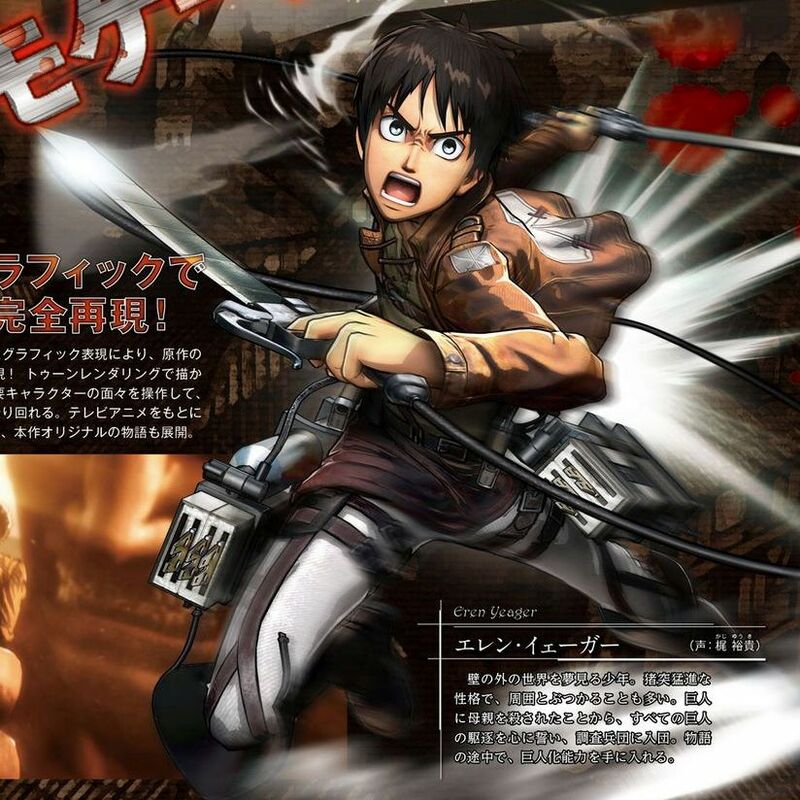 And if you were wondering which characters from the manga and anime would be in the game, Famitsu also confirmed that Krista Lenz, Bertolt Hoover, Reiner Braunm and Annie Leonhardt will not only appear, but they’ll also be playable characters. I had a few butterflies of excitement hit me as I was writing this as the game looks great and these new details are leading me to think this will end up being one of the PS Vita’s biggest games next year. 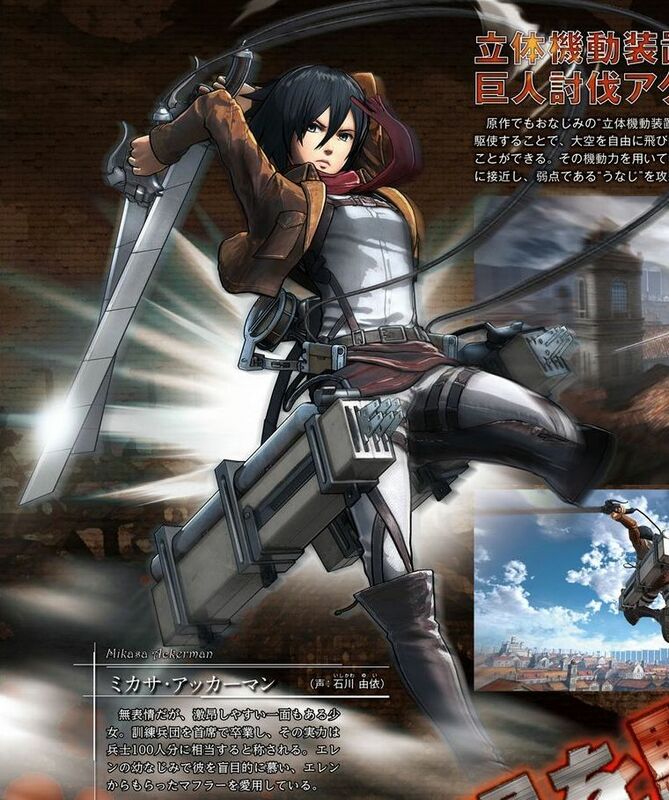 Attack on Titan hits shelves this winter in Japan for the PS Vita, PlayStation 4, and PlayStation 3. North America and Europe will have to wait until next year when announcement is made about it’s release date. We’ve got a ton of new screenshots and tidbits to share with you about the upcoming Attack on Titan, as well as a few gameplay videos to catch you up on! 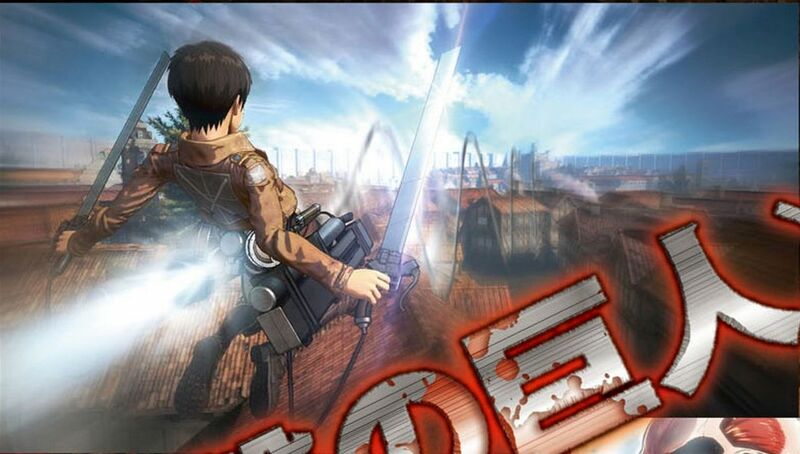 First up we get a look at a range of characters and titans making appearances from the other media the series has been in, including Levi Ackerman, Hange Zoë, Eld Jin, Oluo Bozado, Gunther Shultz, Petra Ral, Moblit Berner, the titan that ate Ilse, and the titans Sonny and Bean. Next up, we have some (very likely PS4-sourced) screenshots showing off some of the in-game areas you’ll be exploring and fighting in – the first of which we’ll be looking at being the rural areas and the ruined city. Moving on, we take a look at some action screenshots from inside the ruined city, and outside the wall – the second location being one where you’re not likely able to use your maneuver gear due to being out in the open. It’s also outside the wall that you may find yourself on a mission to capture a titan, instead of (simply?) killing it. 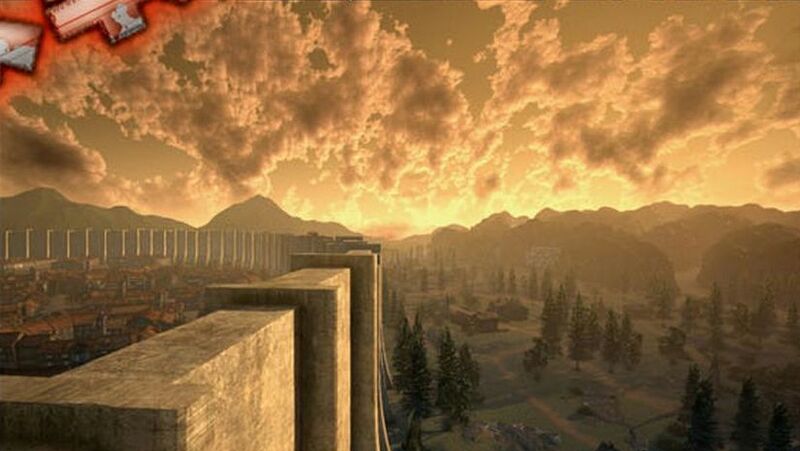 Screenshots below show a player in command of the Levi character who is at a supply camp outside the wall. It’s revealed that you can use this location as an armory of sorts; able to check out your gear, modify weapons and restock supplies. Of course, you can also converse with other characters – which might lead to new quests and content. While that’s all we have for screenshots and details, we do have a bit of catch-up to play with some recently posted gameplay videos (likely PS4 sourced as well). Check out some “Action” and “Camp” footage below. 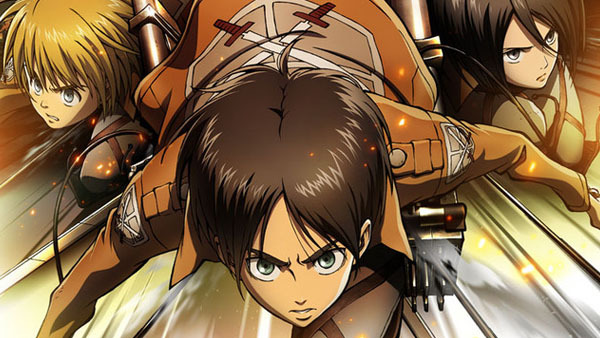 Attack on Titan releases in Japan this coming February, with a Western release to follow before the end of 2016. May Xbox One at PC version pa raw. Sa west lang.